Carrot soup is a decadent way to eat more veggies and warm yourself up on a cold winter day! Made with simple ingredients this recipe comes together in moments for a filling dinner the whole family will love. Pair with crusty bread or a salad for a meatless meal that hits the spot! This soup couldn't be easier to make. It is perfect for cooking a yummy soup for lunch or dinner on a budget and is a great way to get the family to eat more veggies. I love that this recipe freezes well for enjoying the leftovers on a later day. Combine butter and oil in a large pot. Over medium heat, melt the butter then add the onions and celery if you are using any. Add your parsley or thyme and cook until veggies are soft. Add carrots, water and broth. Bring to a simmer and cook for 25 minutes, stirring frequently. When the carrots are tender, transfer the soup to a blender, this might take 3 blender batches to complete. Blend until the soup is smooth. When the soup has all been blended stir in salt and pepper and half and half. Garnish with fresh thyme or parsley. This soup keeps for about 3 days in the fridge or 3 months in the freezer. This recipe will serve 8-10. I like to eat this with croutons for a delicious change! 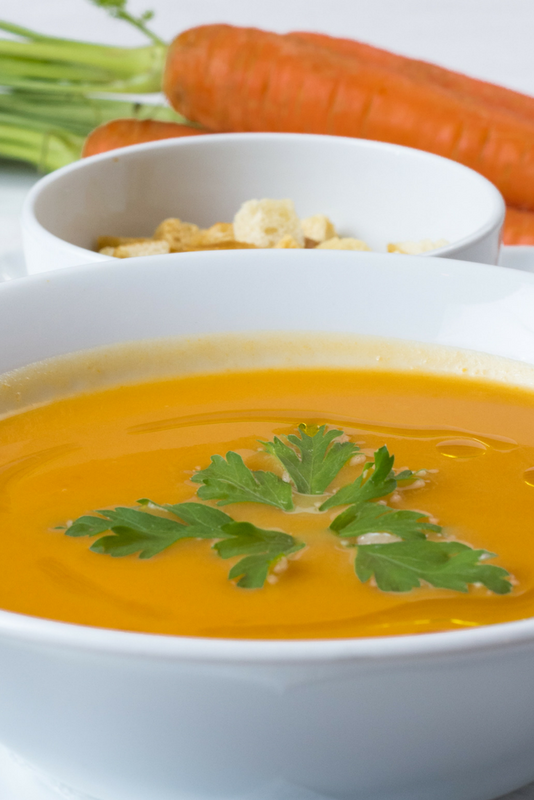 Have you ever made carrot soup? I would love to hear about your favorite soup recipe! You might also like this Calcutta Aubergine Recipe. Sara this is great recipe. Trying it out Love carrots. Got you off the linky. this is a great blog. Love the site Header and structure. See you around.